Waterfowl hunters develop a special glint in their eye when the forecast calls for winter to be at its worst. During those icy, windy, frigid mornings when our neighbors are dumping salt on their driveway and inventorying the contents of their refrigerator and pantry, we're gathering up our gear and whistling into the howling wind. Bad weather means good waterfowl hunting, a day when the birds are looking for a place to drop and are willing to bite on just about any decoy spread you throw out. But then there are those other days, those windless, sunny, unseasonably warm and utterly miserable days when those same neighbors are playing bag toss and firing up the grill for the first time since September. Those beautiful days that the rest of the world enjoys are terrible for waterfowl hunting, because even though you'll be comfortable and warm in the blind, the birds aren't moving. And even if they do fly by, the birds aren't buying into your frumpy little cluster of decoys sitting stone still on the mirror-surfaced water. Fear not. Good weather doesn't always mean bad waterfowl hunting, and there are some tricks you can employ to draw ducks in on those bluebird days. Here is how the experts bag their limits in the dead calm. Don't get caught off-guard by calm days. Before the temperature rises and the winds calm, you need to have an idea of where you can still find birds. "Birds are still creatures of habit, even on bluebird days you have to go where the birds are!" says Joe Thole of Rig'Em Right Decoys. "I Set up in areas that birds are loafing or feeding in, avoid shooting areas that birds are roosting in, this puts less pressure on them and helps to keep them in the area longer." To have a handle on where the birds will be loafing and feeding, you have to get out and scout the territory you'll be waterfowl hunting. Keep track of any areas where you find birds on calm days, and make these areas your first choice during warm, sunny periods of the season. It's also a good idea to write down where you've seen birds and record the details of the weather in a journal. By chronicling what you've seen and taking careful notes on weather conditions and duck movement you'll have a far better understanding of what's really going on in your waterfowl hunting area than if you simply drove around and watched birds. Look for patterns to develop in regards to the weather and keep track of wind direction, temperature change, weather fronts, and dates. On a calm day, birds are more inclined to give your decoys a hard look before committing. This means you'll have to come up with a way to sell the birds on your spread, and movement is one of the best ways to accomplish that. Veteran trainer and clinician Tom Dokken of Oak Ridge Kennels recommends bringing along an old fishing reel spooled with a non-reflective fishing line. For his decoys, Dokken uses 40-50 pound Berkley FireLine and attaches the line to the keel of a single decoy along with a two-pound weight. "It doesn't take a lot of motion, but that little bit of movement can make the difference," Dokken says. He cautions, though, that having too much line or attaching it to a bunch of decoys can create a fiasco, especially if your dog gets tied-up in the middle of a hard retrieve. Having one decoy that moves and that you can manage without creating a mess is a great way to lure in more birds. Thole recommends adding movement, too, but he prefers using a jerk line like the Rig'Em Right Jerk Rig. He also adds that having large, easy-to-see decoys that are in prime condition is important. "Your decoys will be more visible on sunny days so use this to your advantage," Thole says. "I am famous amongst my hunting partners for using the maximum number of decoys that our boat can carry, so needless to say, I like big numbers, but more importantly, clean decoys that don't have the paint flaking off, broken heads or leaky keels. Be sure you don't have anchor lines wrapped around the necks or two or three decoys touching one another. When it's sunny and calm birds will be more spread out and relaxed rather than bunched tightly together like they tend to be during cold weather late season waterfowl hunts." 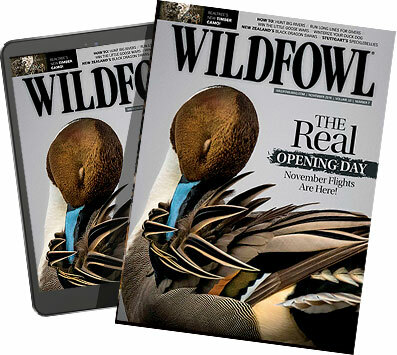 Mike Anderson of Federal Premium Ammunition, who is also a serious waterfowlers, says that you have to mimic natural conditions closely on calm days to get the birds to buy in. "Early season geese tend to have the same pattern during mild weather in that roost on a big body of water and right away in the morning head straight out to a field to feed," says Anderson. "When flying out to feed they will be in family groups and tend to land and feed together." Anderson says that the key to reeling these geese in is to provide a decoy spread that they expect to see. "When setting up your spread you want to make it as realistic as possible. Most family groups range between 4-8 geese, so set your spread to make sure you don't have groups larger than that as this become unnatural. I find myself only using 20-30 full-body goose decoys with 3-5 family groups as long as I am on the "X" in the early season." Bright sunshine and little wind make it easier for the ducks to spot you in the blind, so you have to be careful not to alarm approaching birds. Your goal is to keep the birds focused on your decoys and keep their attention off you, which means you'll need to hold still and camo up. "On sunny, calm days ducks are much more apt to pick out a shiny face looking up, hands moving about, or a boat motor that isn't covered up," Thole says. "Make sure you pay extra attention to detail when it comes to both your hide and what you look like from above! Another overlooked detail is sound, ducks will hear your partner when he says, 'Get ready, here they come Joe Bob' or your retriever whining and moving about. All of these things are magnified without wind! Stay still, keep your face down and be as quiet as possible!" Thole also recommends keeping the sun at your back. This makes it harder for the birds to see you during their approach and puts the light in the hunter's favor. Using the sun to you advantage may make birds commit that would otherwise smell a rat and flare off at the last moment. This will require you to select a blind location that encourages the bird to approach from directly in front of the blind. When you're doing your scouting, make note of the direction of the sun. On a heavily overcast, windy day this is less important than on clear, calm days. Select a few blind sights that will put you in the proper position when daylight breaks. You can get away with mediocre calling when the wind is high, but when things are calm the birds will be able to pick up on a bad tune. The best way to prevent scaring ducks with your off-beat staccato mistakes is to call less and call softer. "Call very lightly, use a timber call and make sure you are only calling them on the corners," says Thole. "Just subtle quacks, leave the ringing hail call at home! The lonesome hen call is a good one to try on bluebird days." If you've selected a location where the ducks are going to be anyway and you've got a believable spread of well-maintained decoys then heavy calling isn't required. In fact, one of the reasons you're missing ducks might be because of all your vocalization. Let the ducks work your spread, be patient and still, and keep your calling to a minimum. Overhunting is one of the quickest ways to ruin a good blind location, and even the best areas need periodic "rest." Sometimes the best option on a dead calm day is to stay home, sleep late, and let the birds pile up. Thole recommends giving your hunting area an occasional break, and there is oftentimes no better occasion to do so than a beautiful, calm day. As much as we'd love to spend every available minute in the blind waterfowl hunting, sometimes the best advice for long-term success is to back off and let the birds get comfortable. If you've been hitting the ducks and geese in your favorite hunting spot pretty hard it's sometimes best to just back off and wait for better (or, actually, worse) conditions.